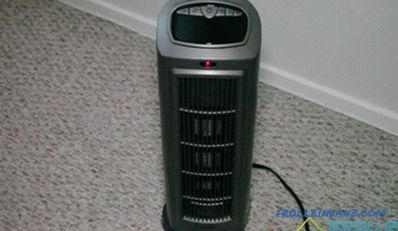 Fan heaters are one of the most popular heaters. After all, they are the cheapest, and you can buy them during the autumn-winter season in every store selling household goods. But not everyone knows that not only the design and color of these heaters differ from each other - what is hidden inside the case is much more important. After all, the “filling” determines how long the device will last, and how reliably it will work. Consider how to choose a fan heater, having studied all their types, as well as the most important pros and cons of each of them. Each device of this type has an ordinary fan that moves cold air, driving it towards the heating element. Heated air masses rush into the room. In those models that are stationary, the fan can be rotated during operation. Due to this, the room is heated more evenly and efficiently. 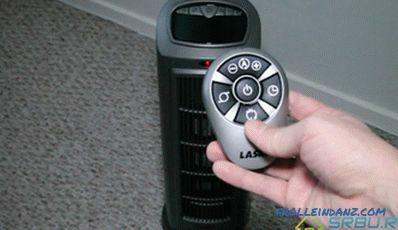 The fan heater is good because it can create a comfortable temperature in the room quickly enough. If the air flow generated by the fan has a narrow direction, then you can almost instantly heat the air only where it is needed. And in the summer, these heaters easily turn into ordinary fans - this opportunity allows you to save both space in your apartment and money in your pocket. The body must be strong enough, it is made of plastic that can withstand some shocks and shocks. Also in the case there are metal parts. Next, we will talk about what types of heating elements are used in heaters of this type, as well as about the design features of the fans used in them. 1. Basically, the difference between fan heaters is the type of heating element. It can be a spiral type, tubular and ceramic. 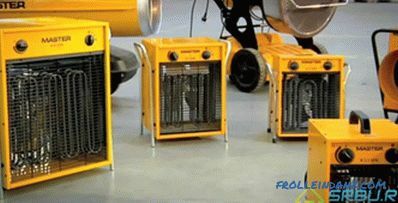 Let us characterize each of them in order to understand what element the best fan heater should be equipped with. The spiral element is made, as a rule, of nichrome. It is a thin wire wound on a ceramic base. An open design is an unprotected wire coil, and a closed version is the same coils placed in a glass tank, inside which there is no coolant. At the same time, the wire heats up to 1000 degrees, which is unsafe, because when tilting, an unprotected or poorly protected heating element can cause a fire. In addition, over time, dust accumulates on the surface of the nichrome wire, which smolders and smells bad when the heater is turned on. After all, by virtue of its constructional characteristics, it is forced to work at high temperatures. However, there will never be an open flame at which oxygen can be burned - the heating of the spiral occurs under the action of electricity. Therefore, the statement that this type of heaters oxygen still burns, is obviously false. It is on hand to sellers selling other models, so they spread rumors. The glass-ceramic heating element works differently than nichrome. It heats no more than up to 150 degrees, so these heaters for the house are safer. 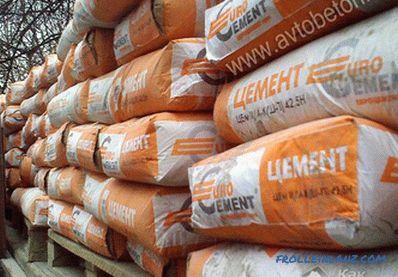 The ceramic part is made in several ways, but the following is most often used: the powder is pressed and then burned in a furnace at a high temperature. In the finished ceramic plate you can see a large number of tiny holes, through which air flows, driven by a fan. At the same time, air masses heat up faster than a nichrome spiral - in fact, the area of ​​a ceramic plate is much larger than the area of ​​a spiral or even a tubular PETN. However, there are heaters with a ceramic element and a significant minus the high cost. So, if you compare them with devices that heat the air with a spiral, it turns out that the latter are cheaper about three times. 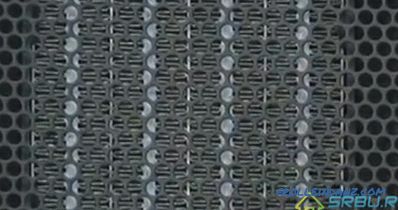 It should be noted that for the manufacture of heating elements is used not only glass ceramics, but metal-ceramic. They have a similar design and characteristics with spiral elements. The difference is that the spiral of nichrome is inside the case not of glass, but of ceramics. Due to this, fire safety is increased. In the photo there is a protective grill of the heater, and under it is a glass-ceramic heating element. Teng (tubular element for heating) - this is a tube made of metal or quartz, inside of which there is a graphite or wire rod. Quartz sand is poured between them, and manganese oxide is added.As a rule, Teng has a quartz filler, the core inside is made of nichrome wire, and the filler is quartz sand. It is needed so that the heat generated from electricity is distributed evenly over the entire area of ​​the heating element. Thanks to this design, the heater does not heat up to 1000 degrees, as a spiral element, but only up to 500 degrees. Accordingly, the service life will double. Unfortunately, the price will increase. 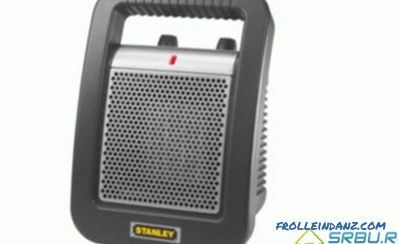 Since the heater is able to multiply the power of a fan heater many times, such devices are more applicable not in everyday life, but in production, garages and utility rooms. There they are called "heat guns", having a power of 2.5 watts and above. This is how heat guns look. 2. Heat ventilating type heaters differ in the fans built into them, which are made of plastic (for small devices) or of metal. Fans are only two types. The axial fan is usually quite small but noisy, it has blades of traditional appearance. It is put only on devices that are supposed to be moved. The tangential fan resembles an oblong cone. On this cone there are twenty or thirty blades parallel to each other. This type of fan is characterized by good performance and quiet operation. It moves more air at a time than an axial model. But due to the large length of the cone, such a fan can only fit in column heaters that are designed for fixed mounting on the floor or on the wall. 3. That's just the next difference between fan heaters from each other is their performance - mobile or stationary. The latter, in turn, can be wall or floor. Portable, or desktop, devices have a power of 400 watts to 2 kilowatts, small size and weight. It is easy to install and assemble them, but they have one drawback - noise. After all, such devices fan is always axial. For fan heaters made in the form of columns, the tangential fan stands vertically. The power of these devices can vary from 1.8 to 2.5 kilowatts, and the performance is higher than that of mobile devices. Often they have an integrated automatic turning device. These devices can be used not only as fan heaters for an apartment, but also as heat curtains in stores, offices and restaurants. At the same time they cut off the cold air from the street at the entrance to the room. Floor heater with a rotating base. 4. The control system of a fan heater can be mechanical or electronic. In some models there is a control panel, which creates some additional convenience of using this device. Electronic system with control panel. If the ceiling in an apartment has a height of up to 270 centimeters, then the device's power is determined as follows: for every 10 meters square, 1 kilowatt. However, it is not worthwhile to take a back to back - it is better to take the device with a margin of power 1.3, or even 1.5 times. 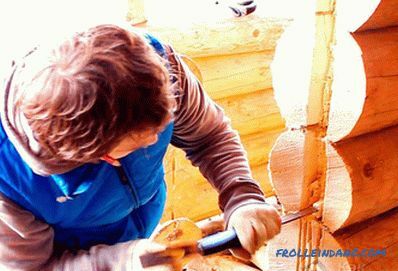 This is especially useful in frosty winter. 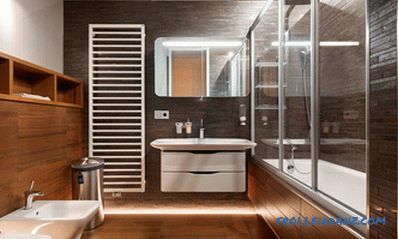 Of course, it is best to choose the fan heater that uses a glass-ceramic heating element. It will not even burn dust, exuding an unpleasant odor, and is much safer than devices of another type - with a spiral and with a teng. Just do not fall for the tricks of the sellers. In an effort to sell the goods as quickly as possible, they may be a bit insensitive and say that the heater is equipped with a ceramic heating element. Only they will keep silent about what is meant not glass ceramics, but metal ceramics, which, as they say, are two big differences. Therefore, simple advice before choosing a ceramic fan heater - carefully read the instructions. If the glass-ceramic plate is almost not heated, then the metal-ceramic element is only slightly better than the spiral one. The number of operating modes of the heater should ideally be as large as possible. This is convenient - without using a thermostat, you can immediately set the desired temperature necessary for the feeling of warmth and comfort. However, the maximum possible number of modes - three, in modern models more is not given. Now that we have learned how to choose a fan heater, it's time to list a few simple rules. They will allow you to remain safe and sound as you and your home, and the device for heating the room and creating a comfortable temperature in it. So, you need to know quite a bit. 1. 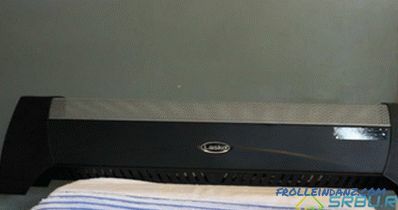 Remember: fan heaters do not like being dropped or dragged by a power cord. Especially bad when the device overturns in the on state. 2. Do not drench the device with liquid (even ordinary water) and turn it on where it is too wet. 3. 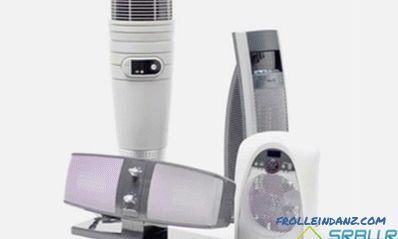 It is necessary to install a fan heater no closer than half a meter from any object. 4. If someone wants beauty and comfort, and he thinks of covering the heater with a cloth, it may happen that he will have to regret it bitterly. Such actions can lead to overheating of the device, and even fire! from 1800 to 2500 Watt 10 m 2 - 1 Kilowatt, but it is better to take with a margin of 1.3 - 1, 5 Kilowatts. Stationary. + Easy to carry and put anywhere. + Silent fans, built-in rotating base are used. Tan. It is better to give preference to glass-ceramic. Number of operating modes Mostly found - 3 modes The more - the better. Tangential. Tangential - more silent. Sensors for tipping and overheating Availability depends on model It is best if these sensors are available. Thermostat Availability depends on model Suitable if there is a need to maintain a constant temperature. 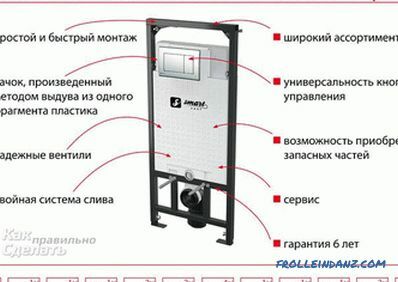 Antifreeze function Availability depends on model It may be useful if you need to maintain the temperature of the room + 5 0 С and prevent freezing. Protection against splashing Availability depends on model If you are going to use the appliance in a bathroom or kitchen - availability is important. Humidifier and filter Presence depends on model Presence is not critical, but desirable. Control panel Availability depends on model If equipped, it is more convenient to operate the heater.